I will arrive on Islay with the evening boat later today, then drive over to Kilchoman House cottages where I'll be staying for the week. Any plans? Well, pick up my Octomore Futures from Bruichladdich. Do a bit of birdwatching (mainly the geese obviously), I believe there's a guided walk by the RSPB on Wednesday. Find out the latest about the Islay Hotel in Port Ellen. Relax with a wee dram and a good book in front of the fireplace at the cottage. 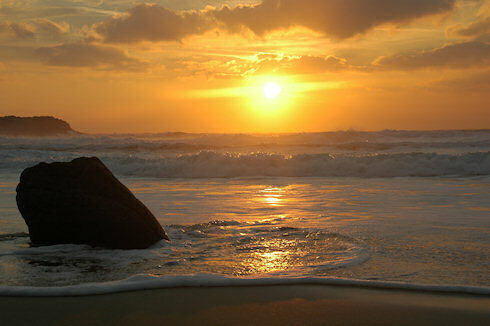 Pick up two of my panoramas Mark at Islay Studios has printed on canvas for me (among them this sunrise at Machir Bay). Meet lots of people. And many many more things. It's very unlikely that there will be much (if any) blogging during this week, so why not read some of the older entries again? There are quite a few in 2006, 2007 and most recent 2008. New Islay blogging in just over a week then, hopefully with many nice pictures and stories to tell! Good night and have a great weekend! !